The creamy quality of kanpachi combines with the spicy and tart tastes of the toppings to make a flavorful, textured dish. Grate the daikon using the rasp side of a box grate, and drain it in a fine mesh sieve. Squeeze some, but not all, of the water out of the grated daikon (you should end up with about 1 tablespoon). Add the sriracha to the daikon, and stir to combine. To make the ponzu, combine the soy sauce and yuzu juice in a bowl. Use a long, sharp knife such as a sashimi knife or a carving knife to cut the yellowtail into thin slices. You want to cut each slice with a single swipe without applying much pressure. Using a sawing motion or applying too much pressure will make the fish flake apart. Arrange on a plate. Top each slice with a small mound of the spicy daikon. You can cover and refrigerate this for a few hours if you need to prepare it ahead of time. 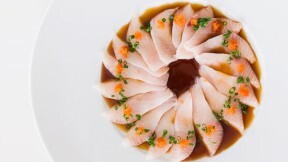 To serve, drizzle the yellowtail with the ponzu and sprinkle with the chives. Serve immediately.